Comedian and Daily Show correspondent Hasan Minhaj will get the honor of hosting this year’s White House Correspondents’ Dinner, which President Donald Trump will not be attending because he has a country to ru(i)n.
The dinner has caused nothing but anarchy among media people, some of whom have chosen to avoid the event altogether. New Yorker and Vanity Fair cancelled their parties around the dinner, as did Bloomberg. And while outlets like CBS News and The Atlantic are hosting their parties as usual, Trump’s presidency has thrown off what’s normally a chill chance for media, politicians and celebs to be pretend-friends in an intimate government setting. The White House staff, normally great sports when it comes to receiving criticism, will also not be there, which takes some pressure off Minhaj but also means he’ll have to work harder to be funny without the buffer of seeing Trump and his people silently fume. Though Trump won’t be “present,” we know he’ll be there in spirit, on Twitter. 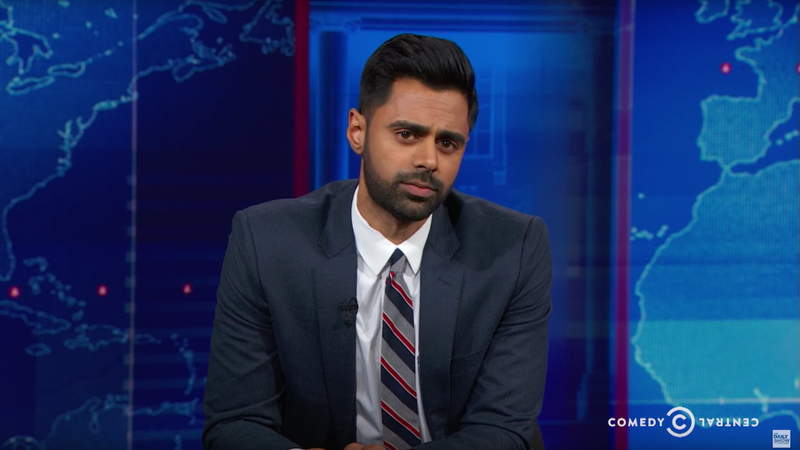 It’s all happening on April 29 at the Hilton in Washington, D.C. Minhaj will have to compete with Samantha Bee, who’s hosting the Not the White House Correspondents Dinner that same night.